Self awareness is the first step of emotional intelligence. It teaches how to identify your emotions and be aware of them, their triggers and their impact. Lists 10 tips for improving your self awareness. Emotional intelligence is the skill to be aware of, control and ultimately express emotions. The latest studies suggest that EQ (emotional intelligence quotient) is more important than IQ (intelligence quotient) for succeeding in work, life and having a better health in general. By mastering it, you could be aware not only of your own emotions (and therefore drivers), but also of the emotions of the people around you (and therefore guide them and in general benefit from the extra information). Self-awareness is the first step (out of four) in improving your emotional intelligence. This skill allows you to spot your emotions as they arise (and not after their devastating effect). It also helps you to anticipate the upcoming emotional reaction by defining and being aware of the things that drive you towards those emotions. Understanding what is an emotion, is beyond the goal of this post so if unsure go to that article in Wikipedia: Emotion. Even if you are sure that you are familiar with the term, I urge to go and check it out. Often people limit themselves with just a few high-level emotions and they cannot actually identify what exactly are they feeling. Emotional intelligence in general is the ability to recognize emotions not only inside yourself, but also inside others. Understanding and noticing your own emotions is called self-awareness. Being able to control your own emotions is called self-control. Understanding the emotions of others is called empathy. And being able to influence the emotions of others is called social skills. How to improve your self-awareness? 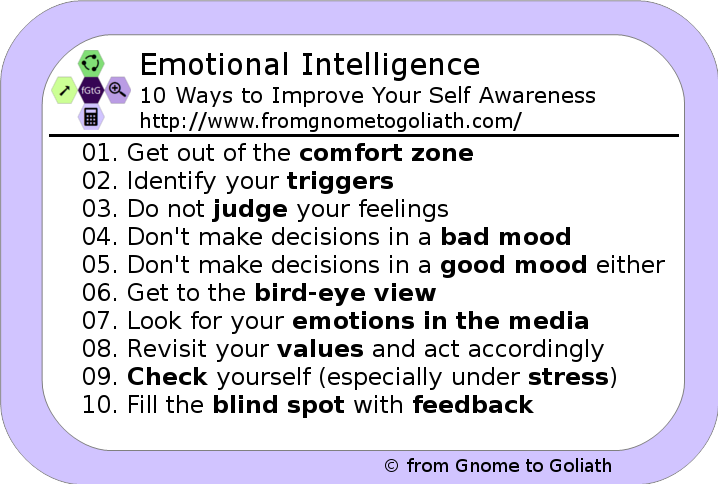 You could improve the self-awareness part of your emotional intelligence with these 10 steps. Have you heard that the magic happens outside the comfort zone? The same is true about emotions. People have the tendency to avoid discomforting feelings. But this is not a long term solution. You should allow the feelings to surface and provide the information they carry. Instead of shoving the emotion away, you should guide yourself to it and through it. Ignoring feelings would only allow them to appear when least expected. And last but not least, getting out of the comfort zone is not that bad. The great minds of our present have daily tasks to “do something unpleasant” in order to expand their frontiers. With practice you will soon discover that it is not that bad. A trigger is a person, a situation or a condition that makes you emotional and prompts you to certain actions. It could be a show-off manager that feeds like a vampire from the energy of the others in the room. Or a very noisy work environment, particularly when your colleagues like talking over the phone and you cannot concentrate. It could also be, for example, a very technical manager who lacks communication or people management skills. The typical response to these stimuli is a shut down. Especially if it happens at work, where emotional outbursts are considered taboo. But even if you enclose your emotions inside you, your body language will go screaming and a keen observer will notice it anyway. Identifying your trigger leads to improved emotional intelligence, because it would allow you to develop the ability to control the outcome. It could give you the skill to calm down, take control of your actions and maintain your presence of spirit. In order to do that you must find the specific cases and start generalizing from there. If you understand what pushes your buttons, that would make the situations more manageable, because the emotions will not come as a surprise. If you decide to go all the way, you can also try to identify the reason behind the trigger. This means finding out exactly why those people or situations push your buttons. For example, a noisy environment could irritate you, because you are more skilled in writing and reading, than in talking and listening. Or that technical manager you hate, could just remind you of a past manager and understanding that this is not the same person, could help you get along with him or her better. A feeling is a feeling, nothing more nothing less. If you try to label your feelings as “good” or “bad” or as “positive” or “negative”, you would lose the ability to regard them and be aware of them. It is in the human nature to judge things and separate them into those two big groups. But it is counterproductive. The “bad” feelings are automatically regarded as something that should be avoided at any cost. You DO NOT WANT to feel them and you may even want to get rid of them. You feel ashamed when you have a “bad” feeling (and shame is furthermore also labeled as “negative”). The “good” feelings however are automatically regarded as something that should be sought after. You WANT to feel them and you may even reward yourself for having them. But you also let them run wild and they drain your energy. … content because you have achieved something. … mournful because you lost something. … frustrated because the reality is different from your expectations. … excites because that family vacation is just around the corner. If you allow yourself to regard the emotion just as what it is, you have the opportunity to understand it and find out what your mind is trying to tell you. When you allow yourself not to judge emotions, they will run its course and vanish and they will not take control of you. Everybody has those situations in life when just everything goes into the wrong direction. Call it “depression“, call it “feeling down” or just “being unlucky“. You feel that you cannot do anything right and a black veil comes down on all your thoughts. The problem here is that, once a bad mood takes control of your brain, you lose the sight of the good part of your life. Suddenly you hate where your live, you hate where you work, you feel irritated by your colleagues. You could also be frustrated with your family, or just dissatisfied with yourself. Deep inside you know that most of what you think is not completely true, but you cannot help get rid of that thoughts. Emotional intelligence through self-awareness teaches that you take notice of the situation and accept is it is. You should be OK that you probably can do little to change the current conditions and just let it pass. What is most important here is that you should postpone any possible life-changing decisions until you are out of that zone! The same is true when you are on the other side of the equilibrium. When you are feeling really, really happy, ecstatic even, it is very easy to do something that you would regret. The first thing that comes to mind is the methods used by skilled salesmen to sell you stuff that you do not want. They get you excited to the point that you lose control of your mind. And when they offer you the merchandise. You could overestimate its values and pay too much for it. I am not saying that good moods are “bad“, all I am saying is that you should be aware of your good moods just like your bad moods. Have your heard the description that someone is “above things“? Well this is also applicable in emotional intelligence. Imagine if you could let go of your personality and watch yourself from above. Like a bird who flies high above the ground and has the whole picture in sight. If you could let go of your narrow first-person vision and look at your life in general. How many more things would you be able to see and understand that way? Even though you cannot actually “look yourself from above“, you can still develop an understanding of your own behavior. You should be aware of your emotions and thoughts as the situations comes to life. You should try to inject yourself between the trigger and the reaction in order to allow yourself to process the whole information and to look at things from above. The goal is to remind yourself of the actual feeling below all layers. For example, if you are a parent of a little boy and you want to serve them something nice for dinner – vegetables and meat. You notice that he does not want to eat them and starts spitting out the food on the floor that you just cleaned. You feel your wrath bubbling inside you. If you “ascend” above the situation though, you will just see a parent who is worried that his or her kid should eat healthy and get enough vitamins. The same goes about emotions. There is a good deal of emotions out there, but they are the same for each and every one of us. You often feel “unique” and that “nobody understands you“, but that is simply not true. Look for your emotions in movies, books, songs or poetry. When a movie moves you, this says something about you. If you take a closer look at the situation and the actions of the characters, you might learn something about you. When you feel like a song has been made “for your“, that also carries information. Look the lyrics up and see what it is all about. This would help you find the words to express your emotions. Your life is dynamic, your job is hard, your family is demanding. You try to set aside time to learn, to have fun and to keep your mind and spirit in peace. Replying to emails, having phone calls, commenting on the social media. Playing with the kids, doing sports with the friends, watching TV. Just half of that activities would be enough to fill your day. And it also causes you to focus on the outside, not on the inside and on yourself. If you feel overwhelmed, stop and review your values. These are just a few sample questions that you could use to re-evaluate your life against your values and beliefs. Values is what you believe in (trust, responsibility, sustainability). Mission is how you want to change the world (I want to make low cost pens available to the poorest people). Goal is what you are aiming at (in 3 years I want to be VP of sales). Self-awareness is mostly internal process, but there are external implications of your internal situation. Get into the habit of examining these regularly in order to make sure that everything is OK.
How does your face look like? Do you shave your face regularly? Do your eyes look swollen? Have you done makeup this morning`? Do you have clean clothes on? How does your desk look like? Is everything in a big pile of mess? Do you walk with your face down? Do you walk with long steps? Be aware of your normal self and be on alert for the times when you feel stressed. Notice how everything changes. If you are aware of those changes, it might be easier for you to detect the stress factors in the future, before they reach your conscious mind. And last but not least, remember the windows of knowledge. There is an intimate part of you that nobody knows. And there is the shared part which is public. But there is always a spot that you do not see. This spot is called “the blind spot“. Your own view of yourself can never be impartial, but the others may see what you truly are. Do not be afraid to look outside for help. Get your partner to a comfortable location and ask him or her for feedback. Gather your friends and talk to them. Ask even your parents. We all know that most parents are too eager to bestow us with their feedback anyway. Observe the rules of communication. If you ask for feedback, you should be listening more than talking. Open your heart and be truthful. Do not get defensive, the people closest to you only want to help. One of the foundations of successful life is emotional intelligence. And one of the foundations of emotional intelligence is self-awareness. Emotional intelligence teaches you about your emotions and the emotions of the people around you. And self-awareness specializes in teaching you how to spot your emotions, your causes them and your reaction to them. With time and persistence, you could even learn to control them and use them to serve your mind and its purpose. Most people go through their lives without paying attention to their emotions. Either completely ignoring them, or letting them control their lives. Emotions are a powerful force that can do miracles with your life, or completely ruin them. It is the job of your mind to learn to spot them and put itself between the emotion and the physical reaction. By learning that skill, you would finally be able to get the reins of your life in your own hands. I was born in a big family in Europe. Among the many aunts, uncles, and cousins, I grew as an empathetic and diplomatic, but focused child. When I married, I moved several times to different countries, where I got to leverage my diplomacy and empathy on other people and cultures. I love diving deep into the problems that I or other people are facing. My communication skills, passion for languages, and empathy help me understand and influence others. My mission is to make the world a happier place. I believe that everybody is entitled to giving and taking love, happiness, and success. My vision is that everybody finds their special somebody in the world and shares their present and future with them. Why Emotional Intelligence Is The Thing You Need Right Now? How Do You Tell if You're Emotionally Intelligent? Is Emotional Intelligence the Key to the Future?